A pro-gun bill in Missouri may soon nullify federal gun laws within the state, even going so far as to entitle citizens arrested under federal gun statutes to sue the arresting officer. The law amounts to the most far-reaching states’ rights endeavor in the country, the far edge of a growing movement known as “nullification” in which a state defies federal power. The Missouri Republican Party thinks linking guns to nullification works well, said Matt Wills, the party’s director of communications, thanks in part to the push by President Obama for tougher gun laws. “It’s probably one of the best states’ rights issues that the country’s got going right now,” he said. The measure was vetoed last month by Gov. 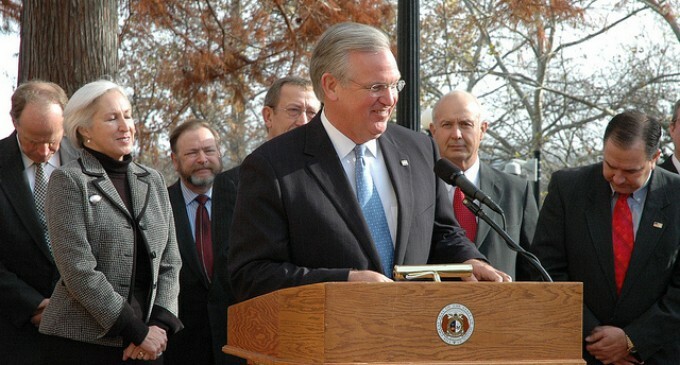 Jay Nixon (pictured), a Democrat, as unconstitutional. But when the legislature gathers again on Sept. 11, it will seek to override his veto, even though most experts say the courts will strike down the measure. Nearly every Republican and a dozen Democrats appear likely to vote for the override. One interesting feature of the debate over the law and its effects is the reference to law and the constitution. It’s refreshing to see that some lawmakers still actually consider the constitution when they draft and implement laws, considering the many recent examples of presidential overreach. Kudos to Missouri for referring to our most important document instead of willfully disregarding it, as Barrack Obama is prone to do. I DOWN 49 TO GO. IF NIXON VETO’S IT WE WILL RECALL OR IMPEACH THIS MORON…….HE HAS A CHOSE OF WHICH!!! He,s up to something the bill said a citizens can sue if arrested it should never get that farr if the law means anything . its better then nothing trust come,s hard after they gave out all the CCW names and address to the Feds in Mo. yes do it, lets keep this going to encourage other states to do the same. This is what America has to do to SHUT down Obama and his runaway Gov. .